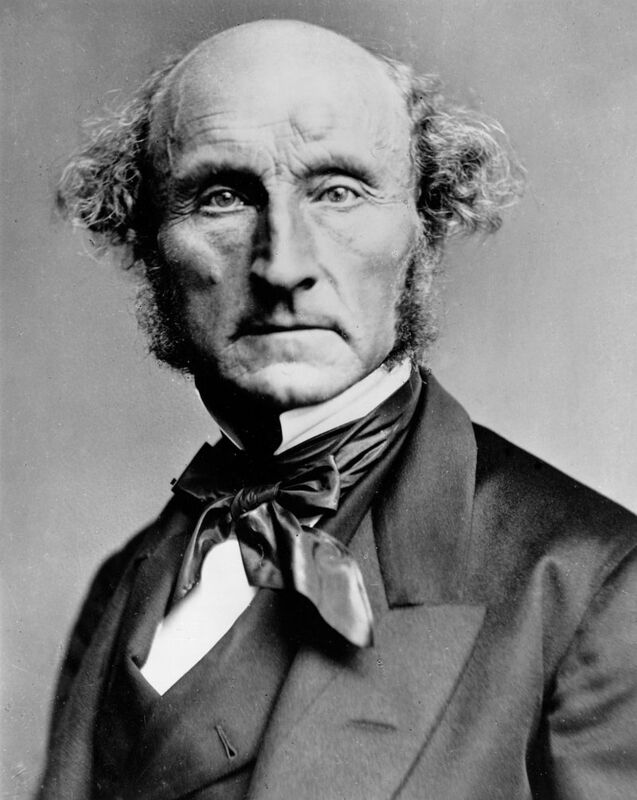 Our MP of the Month is John Stuart Mill (1806-73), who sat as Liberal MP for Westminster, 1865-8. One hundred and fifty years ago this week, the House of Commons voted for the first time on the question of granting the parliamentary franchise to women. In this landmark division, an amendment to the Conservative ministry’s 1867 reform bill put forward by the Liberal MP for Westminster, John Stuart Mill, 75 MPs backed women’s suffrage. However, 196 MPs, including the Liberal party leader, William Gladstone, entered the opposite lobby. by far the most important, perhaps the only really important public service I performed in the capacity of a Member of Parliament: a motion to strike out the words which were understood to limit the electoral franchise to males, thereby admitting to the suffrage all women who as householders or otherwise possess the qualification of all male electors. Women’s suffrage had been part of Mill’s political platform when he stood for election in 1865. During his successful campaign he was supported by female activists including Barbara Leigh Smith Bodichon, Emily Davies and Bessie Rayner Parkes. The following year, he presented the first mass female suffrage petition to the Commons, with 1,521 signatures. In 1866 the Liberal ministry brought forward a reform bill, whose main purpose was to extend the franchise in borough constituencies to include a greater proportion of working-class men. This bill was defeated, but when the new Conservative ministry introduced its own reform bill in 1867, Mill took the opportunity to put a women’s suffrage amendment. Several more women’s suffrage petitions had already been presented to the Commons in March and April 1867, including one from Manchester with 3,161 signatures. any adequate justification for continuing to exclude an entire half of the community, not only from admission, but from the capability of being ever admitted within the pale of the Constitution, though they may fulfil all the conditions legally and constitutionally sufficient in every case but theirs. the notion of a hard and fast line of separation between women’s occupations and men’s – of forbidding women to take interest in the things which interest men – belongs to a gone-by state of society which is receding further and further into the past. A break-down of the division list reveals that an interesting cross-section of MPs voted in the minority with Mill. He took particular pride in having secured the support of John Bright, when ‘ten days before, he was decidedly against us’. Bright would, however, subsequently change his mind, voting against women’s suffrage in 1876. However, Bright’s younger brother Jacob, who entered the Commons as Liberal MP for Manchester at a by-election in November 1867, became a prominent advocate of the cause. He was responsible for securing the right for women to vote in municipal elections from 1869, and brought forward the first dedicated women’s suffrage bill in 1870. Like Bright, the majority of MPs who voted with Mill were Liberals. Among them was Viscount Amberley, the eldest son of Lord John Russell, who had been elected for Nottingham at a by-election the previous year. 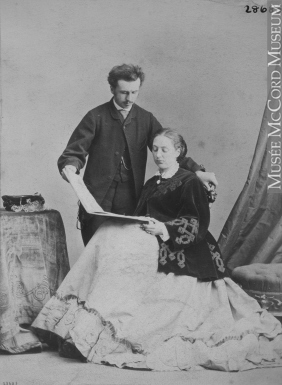 His wife, Katharine, had signed the June 1866 women’s suffrage petition. So too had Clementia Taylor, wife of the Leicester MP Peter Alfred Taylor, who also voted with Mill. Another Liberal supporter of Mill’s amendment whose wife was prominent in the women’s suffrage movement was Henry Fawcett, who had married Millicent Garrett – the future president of the National Union of Women’s Suffrage Societies – less than a month earlier. While many of the Liberal MPs who voted with Mill were associated with the ‘advanced’ wing of the party, there were some surprising names in the minority on the division list. The long-serving Glamorgan MP, Christopher Rice Mansel Talbot, a veteran of the pre-Reform Parliament, had displayed both Whiggish and Protectionist sympathies during his time in the Commons, but voted with Mill for women’s suffrage. Mill also attracted the support of a dozen Conservative MPs, with Russell Gurney, a leading lawyer and MP for Southampton, acting as a minority teller. The future chief Conservative party organiser, John Eldon Gorst, also voted with Mill, as did Benjamin Disraeli’s fellow Conservative MP for Buckinghamshire, Robert Bateson Harvey. A significant number of the MPs who voted with Mill suffered the same fate as him at the 1868 general election, losing their seats. 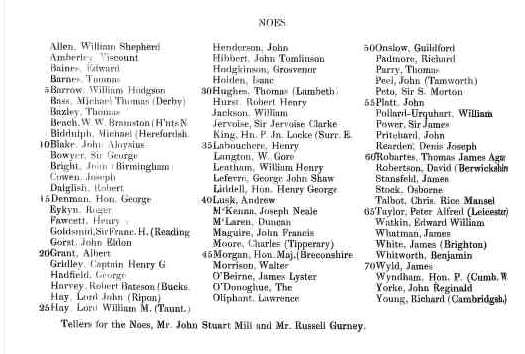 However, there were 19 MPs who divided for Mill’s amendment who would subsequently vote for Jacob Bright’s women’s suffrage bill in 1870. They included not only Fawcett, but also the Leeds MP Edward Baines, the Oldham MP John Tomlinson Hibbert and the Edinburgh MP Duncan McLaren. Although it would be more than half a century before women received the parliamentary vote in 1918, and a further ten years before the 1928 Equal Franchise Act gave equal voting rights to men and women, the division of 20 May 1867 marked an important step in establishing women’s suffrage as a parliamentary question. J. Rendall, ‘John Stuart Mill, Liberal politics, and the movement for women’s suffrage, 1865-1873’, in A. Vickery, Women, privilege and power (2001), 168-200. This entry was posted in MP of the Month, women and tagged 1867 Reform Act, divisions, John Stuart Mill, MP of the Month, petitioning, women, women's suffrage. Bookmark the permalink.